Supplementary material reads: "Snow. Bachelors Ball photo assignments. Friday, February 8 at 7 p.m. First assignment: 7 p.m. Please be at the home of Mr. Manwarring, 235 South Rossmore avenue, where a large pre-ball gathering will be in session. 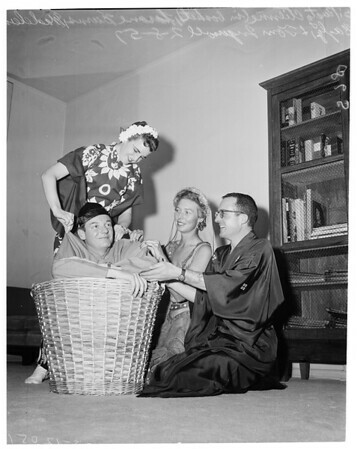 First ask for Guy Greenwald, president of The Bachelors, and get a good 4 col. picture of him with the girl he is escorting, Miss Anna E. La Chapelle, and another bachelor and girl that Mr. Greenwald will select. Then have Mr. Greenwald point out several other members of The Bachelors and take several 2 and 3 informal shots of these different groups. I especially want members of The Bachelors as the men in all pictures (no others, please, and Mr. Greenwald will indicate them). Other Bachelor members at this gathering will include Victor Etienne III, Tom Ingersoll, Ed Brown, Palmer Casey, Edward M. Brown, George Mitchell, Chauncey Medberry III, Hector McNeill, Jerry Patterson, Bob Wheeler, Ben Cowles and Julian Harwood. (Would like, if possible, to get McNeill and Jerry Patterson with their gals in one or two groups)".